The Provincial Insurance Company was founded in 1903 by a wealthy cotton merchant called James Scott. His main objective in forming the company was to create a vehicle that would transmit his wealth to later generations of his family. This intention was fulfilled. The company remained almost entirely in the hands of his descendants and during its first 50 years of operation its gross assets grew more than 150 fold from a substantial initial base. Until his death in 1913, James Scott controlled his company while his sons served an apprenticeship in the business. Subsequently his elder son Samuel succeeded him as chairman and his younger son Francis succeeded his brother in 1946. Francis Scott's son, Peter, joined the company's management in 1946 and succeeded his father as chairman in 1957. He, in turn was followed in this office in 1977 by Charles Shakerley, a great grandson of the founder. Initially the Provincial dealt exclusively in fire insurance. Before the First World War the company undertook accident insurance and ventured tentatively into foreign markets. During the War it opened marine insurance and motor insurance departments. 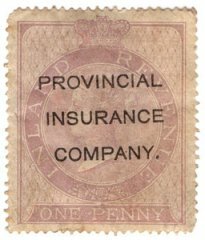 After 1920 the Provincial grew rapidly and by 1938 it accepted all forms of insurance (except for life assurance) and was well established in a number of foreign markets. By the outbreak of the Second World War, the Scott family's initial involvement of £75,000 had been converted into a company with an estimated value of over £2 million. In 1994 the Provincial Insurance Company was acquired by Union des Assurances De Paris (UAP), the largest insurance company in France. Two years later UAP was taken over by a French global insurance group called AXA.